THE next world’s championship prizefight may be held in your neighborhood theater! 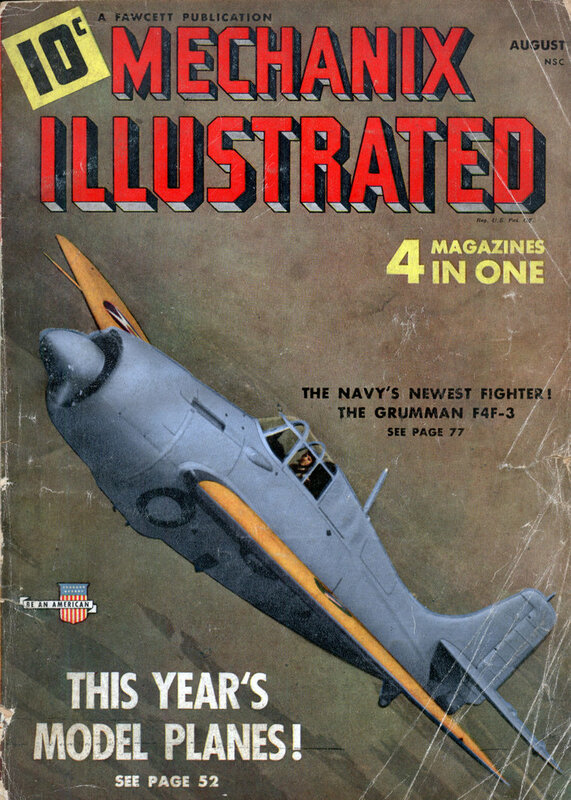 Or perhaps it will be the Kentucky Derby, the Rose Bowl football classicâ€”or even a battle of the World War! Theater television has become an actuality. Before so very long, you may be able to relax in a seat of your corner movie house and view the World Series, as it is actually being played, televised on a regulation size motion picture screen. The Radio Corporation of America demonstrated that this can be done at a recent exhibition at the New Yorker Theater, New York City. An invited audience of celebrities of the sports and theater world sat in the showhouse and saw the Billy Soose-Ken Overlin match as it was being fought in nearby Madison Square Garden. Giant images of Soose and Overlin, 20 feet tall, were projected on the screen. The audience, of nearly a thousand, saw the blow by blow fight as though they were actually standing in the ring. Trained sports reporters, in addition, gave them a blow by blow description of the scrap, and “three-dimensional” sound equipment, through a special installation, brought them all the crowd noises of the fight so as to create an almost perfect illusion of being at the ringside. A board of sports and theater experts at the special theater television preview agreed that it would not be long until hundreds of theaters all over America would be equipped with similar television projectors. When that is done, it will not be unusual to have an audience of perhaps 1,000,000 fans viewing major sporting events such as the World Series, a championship football game, the Santa Anita Handicap, the National Open golf tournament, or a major prizefight. It is possible that actual battle scenes may be brought into your neighborhood theater on special occasions, they said. 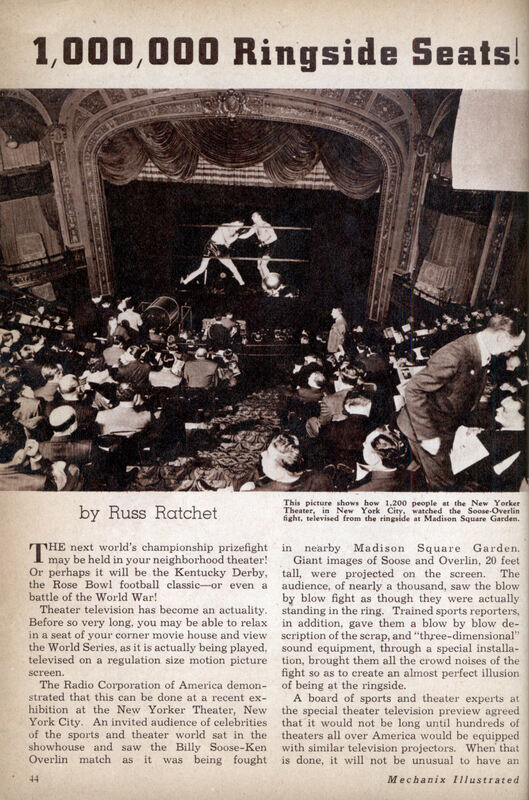 At this demonstration, the Soose-Overlin fight was televised at the ringside, carried to RCA studios by telephone wire, and then carried over another circuit to the theater. It would have been possible for 10,000 other theaters to have shown the same fight simultaneously had the circuit been extended and the theaters properly equipped. T. F. Joyce, vice-president of RCA Manufacturing Co., announced at the showing that a television cable already has been installed between New York and Philadelphia. Mr. Joyce pointed out that a theater television program could be made up of three different types of entertainment: 1. Live talentâ€”such as a New York stage show; 2. Special newsreel or movie projections; 3. “Spot” news events, such as prizefights or football games. “All that is necessary for such programs to appear in your theaters is for some agency to organize a television program service,” Mr. Joyce said. “RCA is prepared to provide the equipment.” John Kilpatrick, president of the Madison Square Garden Corp., declared he had no doubt but that theater television would become a paying venture from the point of view of showmanship. At its special preview of theater television, RCA “shot” the Soose-Overlin fight with a mobile television unit using special telephoto lens. Television cameras caught the light impulses and parabolic microphones picked up the sound. Together, these light and sound impulses were conveyed by telephone wires to NBC studios in Radio City, and from there were relayed to the New Yorker Theater over a balanced telephone wire. At the theater the signals were “unmixed,” the sound impulses directed to a battery of “three-dimensional” loud-speakers placed on four sides of the theater, and the light impulses were routed to the special projector. The theater television projector, which looks like a steel drum, is 34 inches in diameter and 34 inches long. Inside it is the kinescope, a big television tube built to handle 60,000 to 70,000 volts, supplied by a high voltage transformer which stands near the projector. The televised images materialize on the face of the receiving tube and are cast on a 30-inch concave mirror, which reflects them through a rectifying and magnifying lens to the screen, 60 feet away. The screen images, 15 by 20 feet in size, are clear and have an easy-to-look-at bluish tint. The sound operator watches the action on the screen and, to produce the “three-dimensional” sound effect, manipulates the controls so that if an actor is speaking on the right hand side of the screen, the sound comes through loudspeakers on the right wall of the theater. Cost of equipping a theater for television projection at the present time would be between $25,000 and $30,000, Mr. Joyce estimated. Increased demand, however, would probably pare the cost soon, he said. Bill Klem, famous baseball umpire, who appeared at the New Yorker television show, was one of the most enthusiastic commentators on the future possibilities of the idea. “Sixty million baseball fans pay money to see baseball games every year,” he said. “The fans paid over $1,200,000 last year just to see the World Series. “If there are that many people able to spend that much money actually to go to see baseball games, think of how many millions more there must be who would pay to go to a convenient movie house and see these games at low prices. The grand daddy of surround sound! That’s gotta be annoying for the sound operator to move the volume switches manually every time someone talks at different angles. This was certainly being done in the 60’s for Muhammed Ali fights. Though I’m sure the technology was a bit updated. I never got go to those original pay-per-view at a local colesium. But there was always the option to watch the fight the next Saturday on ABC’s Wide World of Sports.